Discover Dorset's UNESCO World Heritage Site, the Jurassic Coast, on this 1-day private tour. Visit Durslton Park with nature reserve with its 40 ton limestone Globe then Corfe village, with its castle built by William the Conqueror, admire the natural arch of Durdle Door, horseshoe-shaped Lulworth Cove, and explore Portland Isle and the seaside town of Weymouth. You'll discover 185 million years of geological history as you stroll the sculpted coastline. Your personal guide will pick you up at 9am from Portland or earlier from other Dorset locations in private, climate-controlled vehicle for the 50-minute drive to the pretty village of Corfe. Built almost entirely from local grey Purbeck limestone, Corfe is a very traditional English village, with a small selection of shops, a post office, a church, and a couple of pubs: stop here for a tea, a coffee, a full English breakfast, or even an early cream tea! Towering above it on a natural hill are the dramatic ruins of Corfe Castle, built in the eleventh century by William the Conqueror, to guard the gap between the valuable marble quarries at Purbeck and the rest of England. Now it's off to the Jurassic Coast. 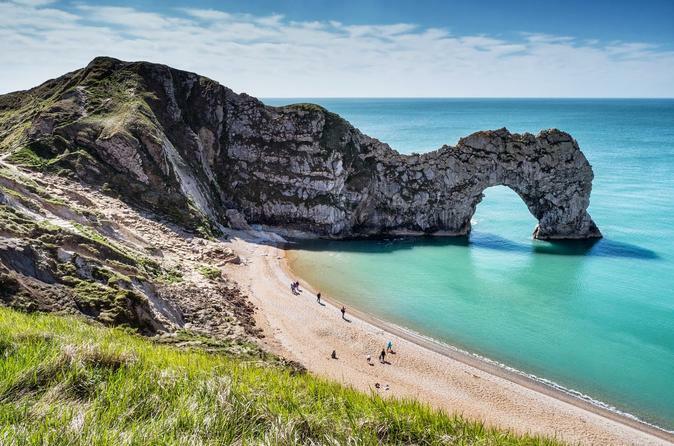 You'll drive 20 minutes or so to Durdle Door, an impressive natural 140 million year old stone arch stretching out over the English Channel, before the short drive or walk to the horseshoe-shaped bay of Lulworth Cove. At the visitor center, learn about the geological processes that carved the cove into this unique shape, before you stroll along the UNESCO-listed coastline. Next, drive 30 minutes or so to Portland Isle, crossing the narrow causeway that separates it from the mainland. Portland was the sight of the 2012 sailing Olympics. Enjoy stunning views across the Jurassic Coast, admire the lighthouses at Portland Bill, Pulpit Rock and explore the three separate castles which once guarded this strategically important island: the oldest is in ruins, but two others are well-preserved. Hop back in the car for the short drive back to the seaside town of Weymouth, where you can choose to ascend the 174-foot (53-meter) viewing tower for stunning aerial views. Finally, and if we have time, you'll head to the quaint village of Abbotsbury with its tea rooms and gardens before your guide drops you back to the Dorset location of your choice. As this is a private tour, the precise duration varies according to your needs and interests, but most guests finish the day around 5pm.